What is a marketing funnel? I can not count the number of times I’ve seen that question in a group, or a client has asked me to explain it. They also want to know the marketing funnel stages and what any of it has to do with promoting a health or life coaching business. These are great questions because I think there is a lot of confusion about funnels, especially among coaches. Marketers throw the word funnel around for email, webinars, and opt-ins, but don’t explain WHAT it is. They explain pieces—you need a landing page, an email funnel, a webinar, a discovery call. But not WHY and why that order. I’m going to answer that for you now because I want you to understand the marketing funnel. I also want you to understand how it help you serve your ideal clients. 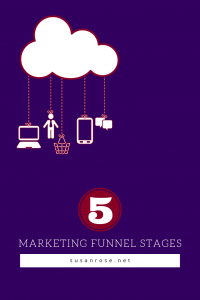 Marketing funnel, sales funnel, buyer’s journey, digital funnel… these are all the same thing. The notion of the sales funnel has been around for years. I first heard the term about 20 years ago, but I don’t think it was new then. No matter what industry you’re in and no matter what you’re selling (or even how much it costs), you take your ideal client through the same process. That amount of time a person stays in a different stage of the funnel depends on what you’re selling and the price point. There are five stages, as shown in the infographic below. A good way to think of it is to think of dating. Chances are, you wouldn’t marry somebody you just met (unless you’re in Vegas, but that’s a different blog 藍). Your suitor is going to take you through five stages. You’ll become aware of him, say, on a dating site. You like what you see. Therefore, you are interested in learning more. And so you exchange messages with him and get to know him. You’re also interested in some other men. You go on a few dates and evaluate them based on what you’re looking for in a mate. You choose the one (okay, I can’t think of anything that doesn’t sound gross for purchase here, but you get it). Throughout your relationship, he continues building trust and treating you well, ensuring you stay loyal forever. That’s the dating funnel, or BFF funnel, or picking a restaurant for dinner funnel. Now that you see the stages, can you see how funnels are so important for promoting your coaching business? Great. Then how do you do it? Let’s look at the webinar funnel since so many coaches use that model (and they use it because it takes ideal clients through the stages quickly when done well). Step 1: You create an ad that identifies your ideal client’s pain point, making them aware of you. You may also post in groups talking about that pain point. They’re now aware. Step 2: You send them to a landing page inviting them to learn more from you. You tell them what to expect, they’re excited and the register for it. Step 3: While they’re waiting for the webinar, you send them a few emails to build more awareness of who you are and why they should listen to you. What is your experience and your story? They’re getting more interested by the moment. Step 4: They attend the webinar and you teach them how to address their problem. This webinar provides a smooth transition from interest to evaluation. As you build trust and share valuable information, they begin the process of deciding if they’re going to purchase a solution to their problem. They have now entered the evaluation phase. They may or may not evaluate your program against others. Post webinar, you send out a series of emails with case studies, more of your story, and more value. You also send social proof—testimonials and press. This builds trust during the evaluation period and helps them realize you’re the one. Step 6: They buy because you demonstrated the value of your program and you have a new BFF. Step 7: You continue nurturing the relationship, first through your program and then through consistent follow up and engagement. While this is the webinar model, you use the same general process for anything. You may tweak it a bit for a speaking engagement or a free download, but you’ll take the buyer on the same journey. Where your ideal client is in the funnel dictates what kind of language you use, how long your emails or videos are, the pace, and the tone. For example, in the awareness stage, you are interrupting them from whatever they’re doing—shopping for new shoes, checking up on high-school friends, searching for wine. Therefore, you need to use emotional language that gets them to stop and say “whoa, that’s me!” Copy needs to be short and to the point. During the evaluation phase, you need to appeal to their logic. They are now deciding not if they’re buying, but who they’re buying from. You need to educate them and show your expertise. This is why webinars are 45 to 90 minutes; that’s how much time it takes. Your pace with be slower and your tone rational. As a result, different channels (the places where you distribute content, such as social media, video, advertising, blogs) are better suited to different stages in the funnel. That is one of the reasons why it’s important to market in multiple channels. If you still have questions about what a marketing funnel is, drop a comment and I’ll do my best to answer it for you. Susan – I love this post. You really make the sales funnel process clear and easy to understand. I will definitely be sharing this post with my clients! Thanks Lisa! I just published another infographic about why email marketing is so important. Check it out.